DON’T know what hit me! 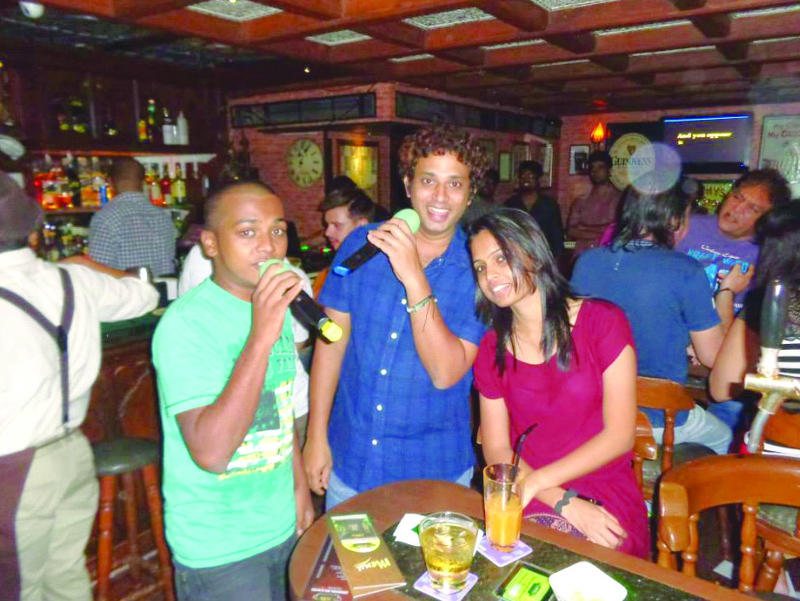 I found myself accompanying a friend who loves to go karaoke-ing at one of several karaoke bars in Goa now. This one called Beetle Café was tucked away down a lane in Porvorim, a snug place with a garden café and indoor restaurant doing a range of beverages, snacks and meal combos. — a brand new venture by Sheetal and Jaydeep Rajebhosale, who are also proprietors of Marbela Beach. Most who come in for karaoke-ing every Saturday enjoy snacking on pizza, sandwiches, nachos — the “loaded nachos” is popular finger food here. Say the gentle pass-time of karaoke-ing offers a kind of challenge and fellowship…in between snacking, chatting, catching up with whatever. Karaoke bars are becoming very popular and some of them can be very upmarket. Karaoke is catching on like wild fire, oh, okay, maybe not like wild fire. But from the sound of it more and more young and not-so-young folk are taking a shine to it, and I can’t think of a better, healthier pass-time for an evening with family or friends. First of all karaoke was born and developed as an interactive entertainment in Japan. The Japanese perfected the form and the idea spread to the rest of the world where folk like their music and songs and want to sing along too with some help — oh, no, not like professionals but like amateurs (who may be better than professionals on the rare occasion). It’s a bit like communicating with a bit of song and dance as in old-fashioned Hindi films…but karaoke is here and now and for real, not a film. Perhaps one may even compare it by stretching the imagination with a singing game we often play wherever there are Indians — antakshri! Forget antakshri. Karaoke is in a class of its own with its own exclusive charms. If you don’t want to read a book, see a film, drool over food in a restaurant…well, check out karaoke. Get over doing marijuana, hookah/shisha or other such self-indulgent pass-times! Karaoke has so much to offer if you’re a music and song person (and who isn’t in lesser and greater ways) and willing to say it with a song — with the lyrics up on a screen before you to prompt you. Why not? Sing a song several times and you’ve got it by heart surely, no? True, the world is full of songs and there must be thousands, millions of songs. One may only love a few! 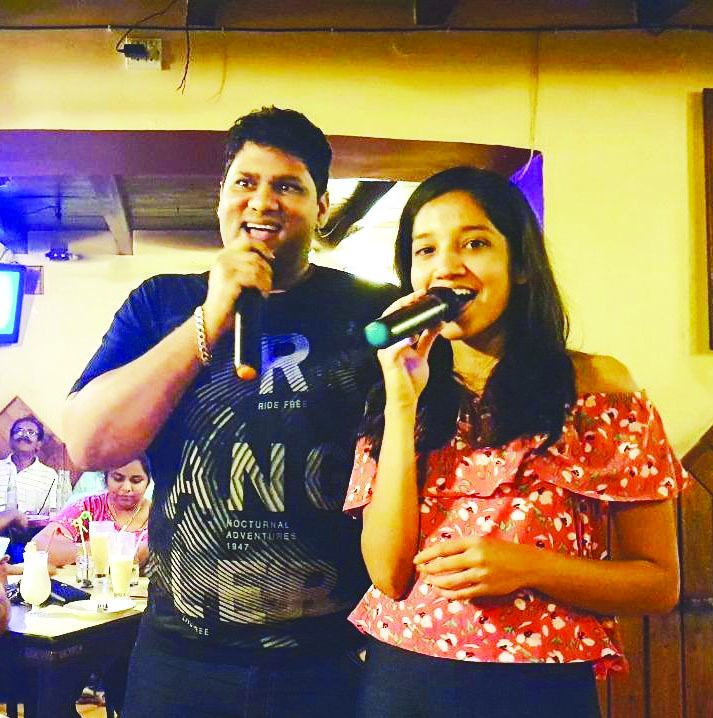 KDJ Sullivan Noronha, the karaoke disc jockey at Beetle Pub, who spends some time cajoling and wooing everyone present to sing on karaoke came up and asked me if I wanted the mic and I quickly said no, thank you, but will you sing me a song? My current favourite is Alan Jackson’s “The older I grow”. It has replaced my old favourite, Frank Sinatra’s “I did it my way”. He said he is not familiar with the first song but was happy to sing me the second song and did a great job! Of course if you don’t want to karaoke you may request a KDJ to do a request number, sing your song for you. But his job is to get you to sing it yourself, karaoke style! 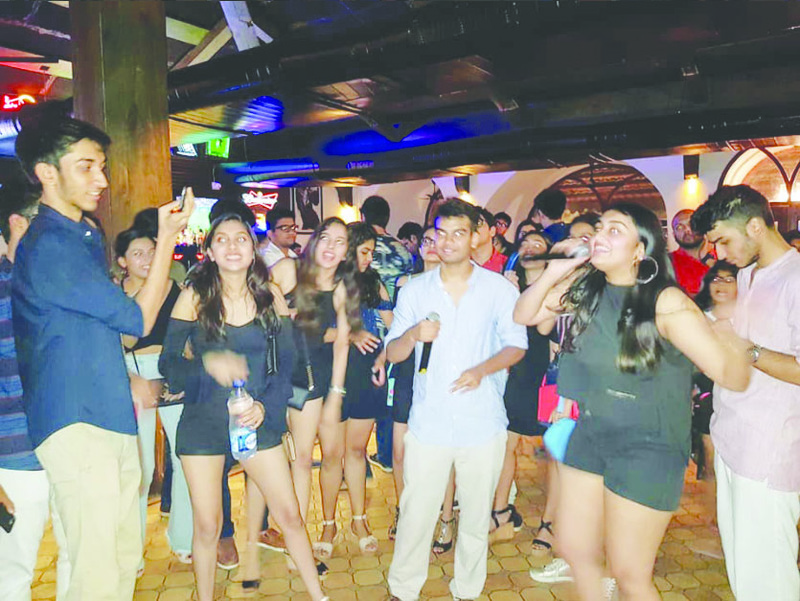 He’s a member of the Ka3aoke Company set up by brothers Pierre and Ashly Fernandes — a group of KDJs who take turns to set up karaoke systems at various places. They started the group with a friend Alton Fernandes way back in 2011, but since then the group has grown and expanded and now has six members, all of whom also have alternate careers with some of them being part of well known Goan bands. All traditional band singers sing songs on request, but somehow karaoke has an upfront personal touch and makes one feel as special as…er… punch. I mean singing one’s own song can give one a high of achievement. Mind you, not all songs are as easy to sing along as you imagine, even with a music video and lyrics in sync in front of you. Some voice you need to have and some sensibility…although joie de vivre sometimes helps to make for a memorable party and companionship. I ordered a ginger ale, sipped, watched her karaoke-ing confidently with KDJ Sullivan (KDJ for karaoke disc jockey) announcing and introducing her along with the song so that the rest in the restaurant bar would take time out to listen, join in, applaud. Some karaoke singers choose a song but are unable to complete it and give up half-way with a shrugging of shoulders! But the crowd still applauds the effort; better luck next try. So you see, karaoke may sound as easy as a breeze, a fun way to pass-time, but up to a point. If you don’t have a head for tunes and are nervous… do practice in the bathroom first or before the mirror at home with family to boo or applaud. Needless to say karaoke is all the craze in places around the world and in urban India and in amchya bhangareche Goem. After all Goa is traditionally a musical state, music, song and dance comes naturally to most niz Goenkars. 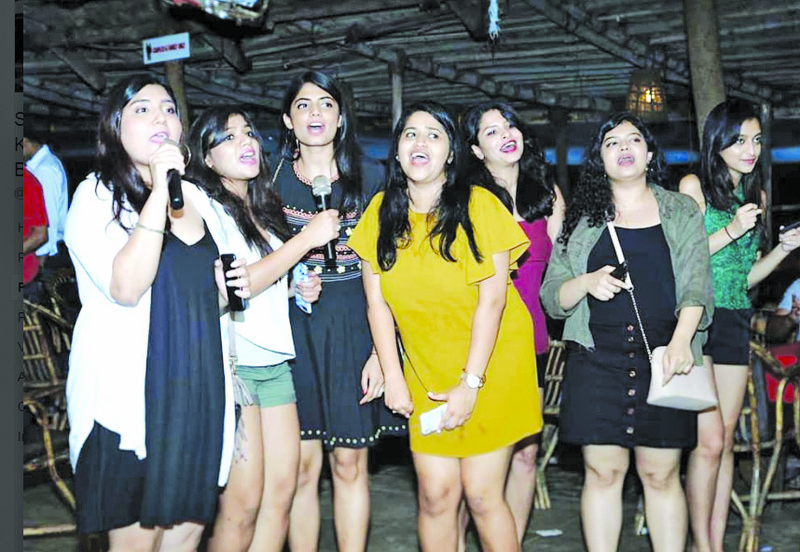 Young Goans have taken to karaoke like ducks to water or so to speak — just call at one of the karaoke restobars in town. 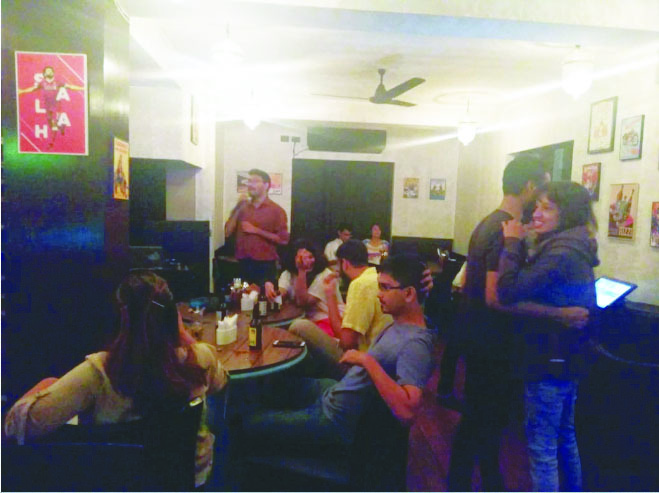 Panaji alone has half-a-dozen of them with names like Tavern, Mojos, Bay 15, etc having one night a week dedicated to karaoke. Elsewhere in Goa one hears of posh restobars offering state-of-the-art acoustics for karaoke singing to its patrons…with some excellent cocktails and mocktails, snacks to live for and die for, a fancy food menu too. This is to say discover the charms of karaoke-ing as soon as possible and introduce your children to it! 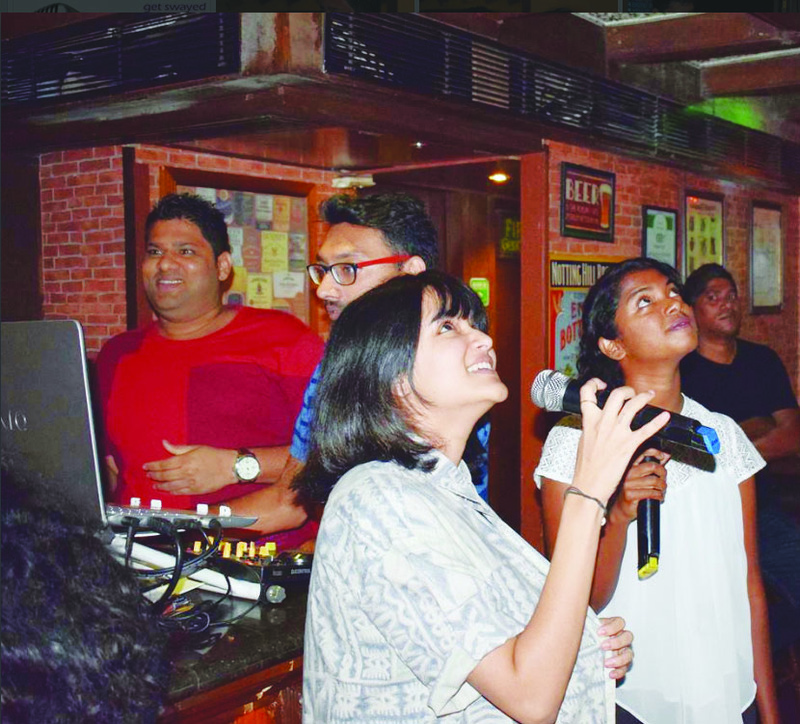 Some of the Karaoke restobars offer both English and Hindi karaoke singing… so you may sing “Aa bhi ja…” or “Badan pe sitaron lapete hue” or “Love me tender” or “Achy breaky heart” or some of the ABBA songs or…how many songs are there in the world? Hey, go belt it out, karaoke singing makes for some of the best rest and recreation time-pass I can think of. If you don’t want to sing, listen to your friends singing their hearts out! 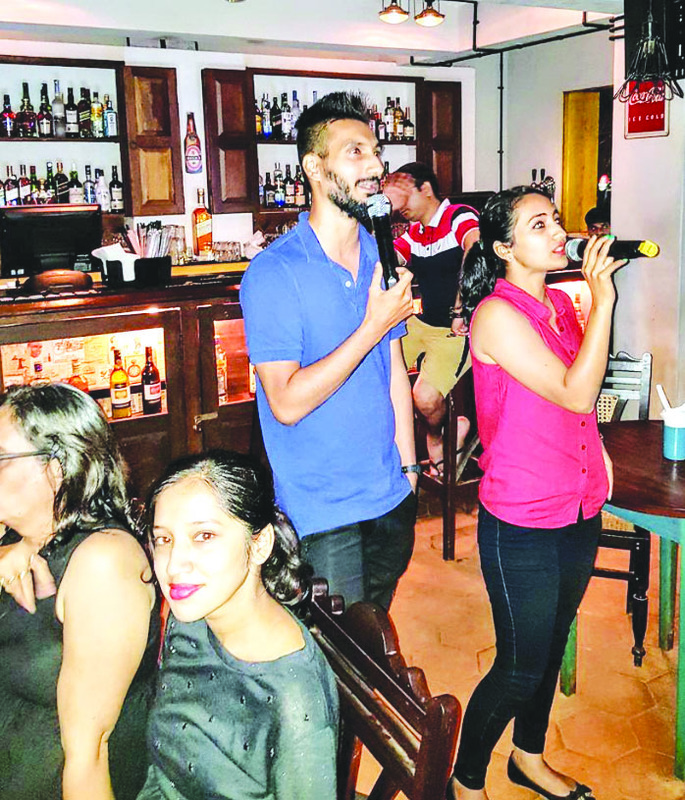 Karaoke is here to stay and may it go places in Goa. ST ANTHONY’S: St Anthony’s at Baga is one of the few restaurants that has karaoke almost every night!